You can now setup conditions to route answers to different questions. To do so just click the logic tab on your multi-choice questions in the Survey design page. You can now create multi choice checkbox questions which allow your respondents to select multiple choices in your questions. When creating surveys connected to a Facebook page you own some users have had issues connecting their surveys. This is now fixed and your surveys will work when connected to your facebook pages. 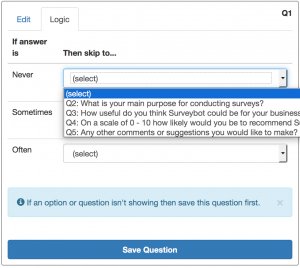 We also fixed a bug where some users found their surveys were triggering multiple questions at a time. 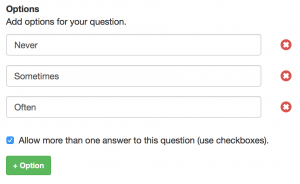 Surveys now function properly 1 question at a time.